There is not much of a recipe here, but I am just in love with tangerines right now. Their season is coming to a sweet, sweet end in my backyard. For some reason they are extra sweet this year. I’ve heard it’s because of the drought, does anyone have an idea why that would be? Maybe it’s just because they’ve been hanging up there for so long. Either way, I’ll take it. 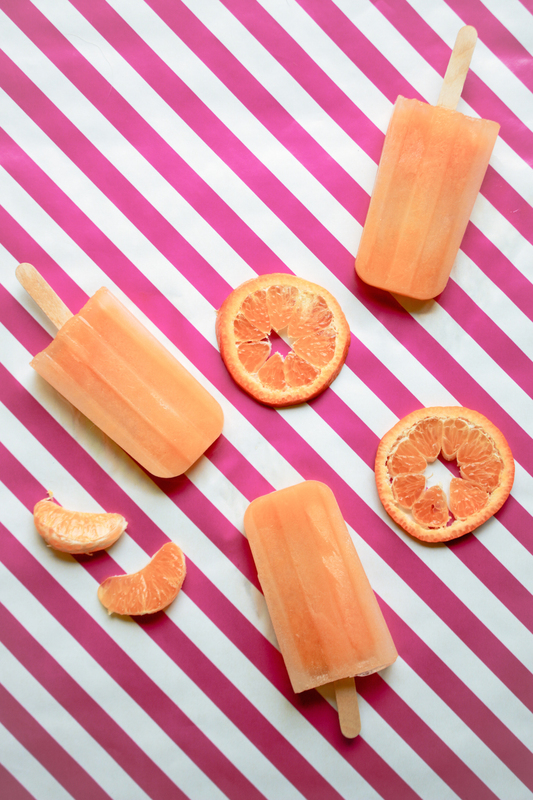 These pops would probably be prettier if I tossed some tangerine slices in the molds (like on my Sweet Tea Pops). They would probably be even more delicious with a bit of creaminess and some vanilla, like my Peaches & Cream Pops. But when it comes to backyard tangerines, I guess I am a purist. I like my tangerines straight up, or straight juiced. Recipe: Juice approximately 2,846 tangerines. This will take approx. 2 hours. Strain the juice several hundred times. Pour it into pop molds. If your juice isn’t sweet enough for you, mix some simple syrup in before pouring into molds. This is our favorite pop mold: Norpro Ice Pop Maker. Soak your popsicle sticks in warm water. After an hour in the freezer, insert popsicle sticks. Freeze for four to six hours, but preferably overnight. Try some of our other pop-ular pop recipes (har) if you’re looking for something more fancy for a party or BBQ.